Two enantiomers of a generic amino acid. The two enantiomers of bromochlorofluoromethane. The term chiral is used to describe an object that is not superposable on its mirror image. Human hands are perhaps the most universally recognized example of chirality: The left hand is not a superposable mirror image of the right hand; no matter how the two hands are oriented, it is impossible for all the major features of both hands to coincide. 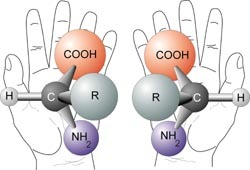 In the context of chemistry, chirality usually refers to molecules. Two mirror images of a molecule that cannot be superposed on each other are referred to as enantiomers or optical isomers. Because the difference between right and left hands is universally known and easy to observe, many pairs of enantiomers are designated as "right-" and "left-handed." A mixture of equal amounts of the two enantiomers is said to be a racemic mixture. Racemic mixtures are not optically active even though their two enantiomer constituents when separated are. Molecular chirality is of interest because of its application to stereochemistry in inorganic chemistry, organic chemistry, physical chemistry, biochemistry, and supramolecular chemistry. The symmetry of a molecule (or any other object) determines whether it is chiral. A molecule is achiral (not chiral) if and only if it has an axis of improper rotation; that is, an n-fold rotation (rotation by 360°/n) followed by a reflection in the plane perpendicular to this axis that maps the molecule onto itself. A simplified (if incomplete) rule is that the molecule lacks a plane of symmetry. For tetrahedral molecules, if all four substituents on the central atom are different, the molecule is chiral. A chiral molecule is not necessarily asymmetric, that is, devoid of any symmetry elements, as it can have, for example, rotational symmetry. The term chirality is derived from the Greek word for hand, χειρ-(/cheir/). The word “racemic” is derived from the Latin word for grape; the term having its origins in the work of Louis Pasteur who isolated racemic tartaric acid from wine. This system labels each chiral center in a molecule (and also has an extension to chiral molecules not involving chiral centers). Thus, it has greater generality than the D/L system, and can label, for example, an (R,R) isomer versus an (R,S)—diastereomers. For this reason, the D/L system remains in common use in certain areas of biochemistry, such as amino acid and carbohydrate chemistry, because it is convenient to have the same chiral label for all of the commonly occurring structures of a given type of structure in higher organisms. In the D/L system, they are nearly all consistent—naturally occurring amino acids are nearly all L, while naturally occurring carbohydrates are nearly all D. In the R / S system, they are mostly S, but there are some common exceptions. An enantiomer can be named by the direction in which it rotates the plane of polarized light. If it rotates the light clockwise (as seen by a viewer towards whom the light is traveling), that enantiomer is labeled (+). Its mirror-image is labeled (−). The (+) and (−) isomers have also been termed d- and l-, respectively (for dextrorotatory and levorotatory). This labeling is easy to confuse with D- and L-. The D/L labeling is unrelated to (+)/(−); it does not indicate which enantiomer is dextrorotatory and which is levorotatory. Rather, it says that the compound's stereochemistry is related to that of the dextrorotatory or levorotatory enantiomer of glyceraldehyde—the dextrorotatory isomer of glyceraldehyde is, in fact, the D isomer. Nine of the nineteen L-amino acids commonly found in proteins are dextrorotatory (at a wavelength of 589 nm), and D-fructose is also referred to as levulose because it is levorotatory. Enantiomeric excess or ee is a measure for how much of one enantiomer is present compared to the other. For example, in a sample with 40 percent ee in R, the remaining 60 percent is racemic with 30 percent of R and 30 percent of S, so that the total amount of R is 70 percent. In general, chiral molecules have point chirality at a single stereogenic atom, usually carbon, which has four different substituents. The two enantiomers of such compounds are said to have different absolute configurations at this center. This center is thus stereogenic (i.e., a grouping within a molecular entity that may be considered a focus of stereoisomerism), and is exemplified by the α-carbon of amino acids. A molecule can have multiple chiral centers without being chiral overall if there is a symmetry element (a mirror plane or inversion center), which relates the two (or more) chiral centers. Such a molecule is called a meso compound. It is also possible for a molecule to be chiral without having actual point chirality. Common examples include 1,1'-bi-2-naphthol (BINOL) and 1,3-dichloro-allene, which have axial chirality, and (E)-cyclooctene, which has planar chirality. An undistorted tetrahedral sp3-hybridized carbon atom bearing four freely rotating rigorously identical substituents can be chiral if the substituents themselves are chiral. C(R)4 and C(S)4 are enantiomers without central carbon nomenclature, such as C-[(R)-C(H)(CH3)(OCH3)]4. C(R)3(S) and C(S)3(R) are sufficient. Homochiral twist-boat cyclohexane rings can be fused to obtain remarkably symmetric yet asymmetric [6.6]chiralane, point group T (not Th or Td), viewed down a C3-axis and a C2-axis. There is no nomenclature for the central carbon's chirality, though it possesses no point, plane, or higher improper axis of symmetry. Normally when an atom has four different substituents, it is chiral. However in rare cases, two of the ligands differ from each other by being mirror images of each other. When this happens, the mirror image of the molecule is identical to the original, and the molecule is achiral. This is called psuedochirality. Normally, enantiomers behave identically. For example, they will migrate identically Rfs in TLC. Their NMR IR spectra are identical. Differences between optical isomers arise in the presence of other chiral molecules or objects. For example, enantiomers do not migrate identically on chiral chromatographic media, such as quartz. NMR spectra are sensitive to chiral additives (see Eufod). Chacteristically, different enantiomers of chiral compounds often taste and smell differently and have different effects as drugs (see below). These effects reflect the chirality inherent in biological systems. One chiral 'object' that interacts differently with the two enantiomers of a chiral compound is circularly polarized light: An enantiomer will absorb left- and right-circularly polarized light to differing degrees. This is the basis of circular dichroism (CD) spectroscopy. Usually the difference in absorptivity is relatively small (parts per thousand). CD spectroscopy is a powerful analytical technique for investigating the secondary structure of proteins and for determining the absolute configurations of chiral compounds, in particular, transition metal complexes. CD spectroscopy is replacing polarimetry as a method for characterizing chiral compounds, although the latter is still popular with sugar chemists. The origin of this homochirality in biology is the subject of much debate. Most scientists believe that Earth life's "choice" of chirality was purely random, and that if carbon-based life forms exist elsewhere in the universe, their chemistry could theoretically have opposite chirality. Thalidomide: Thalidomide is racemic. One enantiomer is effective against morning sickness, whereas the other is teratogenic. In this case, administering just one of the enantiomers to a pregnant patient does not help, as the two enantiomers are readily interconverted in vivo. Thus, if a person is given either enantiomer, both the D and L isomers will eventually be present in the patient's serum. Ethambutol: Whereas one enantiomer is used to treat tuberculosis, the other causes blindness. Naproxen: One enantiomer is used to treat arthritis pain, but the other causes liver poisoning with no analgesic effect. Steroid receptor sites also show stereoisomer specificity. Penicillin's activity is stereodependent. The antibiotic must mimic the D-alanine chains that occur in the cell walls of bacteria in order to react with and subsequently inhibit bacterial transpeptidase enzyme. Only L-propranolol is a powerful adrenoceptor antagonist, whereas D-propranolol is not. However, both have local anesthetic effect. The L-isomer of Methorphan, levomethorphan is a potent opioid analgesic, while the D-isomer, dextromethorphan is a dissociative cough suppressant. S(-) isomer of carvedilol, a drug that interacts with adrenoceptors, is 100 times more potent as beta receptor blocker than R(+) isomer. However, both the isomers are approximately equipotent as alpha receptor blockers. The D-isomers of amphetamine and methamphetamine are strong CNS stimulants, while the L-isomers of both drugs lack appreciable CNS(central nervous system) stimulant effects, but instead stimulate the peripheral nervous system. For this reason, the Levo-isomer of methamphetamine is available as an OTC nasal inhaler in some countries, while the Dextro-isomer is banned from medical use in all but a few countries in the world, and highly regulated in those countries who do allow it to be used medically. Many coordination compounds are chiral; for example, the well-known [Ru(2,2'-bipyridine)3]2+ complex in which the three bipyridine ligands adopt a chiral propeller-like arrangement. In this case, the Ru atom may be regarded as a stereogenic center, with the complex having point chirality. The two enantiomers of complexes such as [Ru(2,2'-bipyridine)3]2+ may be designated as Λ (left-handed twist of the propeller described by the ligands) and Δ (right-handed twist). Hexol is a chiral cobalt complex that was first investigated by Alfred Werner. Resolved hexol is significant as being the first compound devoid of carbon to display optical activity. Tertiary amines (see image) are chiral in a way similar to carbon compounds: The nitrogen atom bears four distinct substituents counting the lone pair. However, the energy barrier for the inversion of the stereocenter is, in general, about 30 kJ/mol, which means that the two stereoisomers are rapidly interconverted at room temperature. As a result, amines such as NHRR' cannot be resolved optically and NRR'R" can only be resolved when the R, R', and R" groups are constrained in cyclic structures. A paper published in February 29, 2008 by researchers led by Sandra Pizzarello, from Arizona State University, reveals that the Murchison meteorite contains sizable molecular asymmetry of up to 14 percent, "giving support to the idea that biomolecular traits such as chiral asymmetry could have been seeded in abiotic chemistry ahead of life." "Thanks to the pristine nature of this meteorite, we were able to demonstrate that other extraterrestrial amino acids carry the left-handed excesses in meteorites and, above all, that these excesses appear to signify that their precursor molecules, the aldehydes, also carried such excesses," Pizzarello said. "In other words, a molecular trait that defines life seems to have broader distribution as well as a long cosmic lineage." Alternative theories of the origin of chirality on Earth have also been proposed, such as the weak nuclear force. ↑ A. Lakhtakia, (ed.). 1990, "Selected Papers on Natural Optical Activity." SPIE Milestone. 15. ↑ L. Pasteur, 1848 (1905). "Researches on the molecular asymmetry of natural organic products." English translation of French original. Alembic Club Reprints. 14: 1-46. ↑ J.C. Bose, 1898. "On the rotation of plane of polarization of electric waves by a twisted structure." Proc. R. Soc. Lond. 63: 146-152. ↑ Ernest L. Eliel and Samuel H. Wilen. 1994. Stereochemistry of organic compounds. New York, NY: Wiley-Interscience. ISBN 9780471016700. ↑ Pedro Cintas, 2007, "Tracing the Origins and Evolution of Chirality and Handedness in Chemical Language." Angewandte Chemie, International Edition. 46(22): 4016-4024. ↑ Infelicitous stereochemical nomenclatures for stereochemical nomenclature. uottawa.ca. Retrieved February 20, 2009. ↑ S-Chiralane, C3-axis. mazepath.com. Retrieved February 20, 2009. ↑ S-Chiralane, C2-axis. mazepath.com. Retrieved February 20, 2009. ↑ A. Streitwieser, Jr., J.R. Wolfe, Jr., and W.D. Schaeffer. 1959. "Stereochemistry of the Primary Carbon. X. Stereochemical Configurations of Some Optically Active Deuterium Compounds." Tetrahedron. 6: 338–344. ↑ Uwe J. Meierhenrich, 2008, Amino Acids and the Asymmetry of Life. (Berlin, DE: Springer. ISBN 9783540768852). ↑ M. Srinivasarao, 1999, "Chirality and Polymers." Current Opinion in Colloid and Interface Science. 4(5): 369-376. ↑ Alex von Zelewsky, 1996, Stereochemistry of Coordination Compounds. (Chichester, UK; New York, NY: Wiley. ISBN 9780471955993). ↑ Sandra Pizzarello, Yongsong Huang, and Marcelo R. Alexandre, 2008, Molecular asymmetry in extraterrestrial chemistry: Insights from a pristine meteorite. Proceedings of the National Academy of Sciences. Retrieved February 20, 2009. ↑ Arizona State University, 2008, Key To Life Before Its Origin On Earth May Have Been Discovered. ScienceDaily. Retrieved February 20, 2009. Anslyn, Eric V., and Dennis A. Dougherty. 2004. Modern Physical Organic Chemistry. Sausalito, CA: University Science. ISBN 9781891389313. Eliel, Ernest Ludwig, Samuel H. Wilen, and Lewis N. Mander. 1994. Stereochemistry of Organic Compounds. New York, NY: Wiley. ISBN 0471016705. March, Jerry. 1985. Advanced Organic Chemistry: Reactions, Mechanisms and Structure. 3rd ed. New York, NY: John Wiley & Sons. ISBN 0471854727. Meierhenrich, Uwe J. 2008. Amino Acids and the Asymmetry of Life. Berlin, DE: Springer. ISBN 9783540768852. Mislow, Kurt Martin. 2002. Introduction to Stereochemistry. Mineola, NY: Dover Publications. ISBN 0486425304. Morris, David G. 2002. Stereochemistry, Basic Concepts in Chemistry. New York, NY: Wiley-Interscience. ISBN 0471224774.
von Zelewsky, Alex. 1996. Stereochemistry of Coordination Compounds. Chichester, UK; New York, NY: Wiley. ISBN 9780471955993. Chirality & Odour Perception at leffingwell.com. Chirality & Bioactivity I.: Pharmacology. This page was last modified on 15 February 2017, at 15:34.